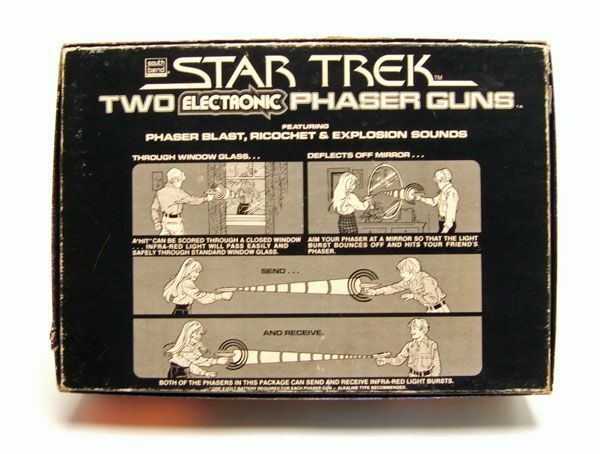 South Bend released this boxed set of 2 "Phaser Guns" way back in 1979. The Rundown: Do you like Star Trek? Of course you do! Do you like Lazer Tag? Of course you do! Well, do I have the perfect item for you! 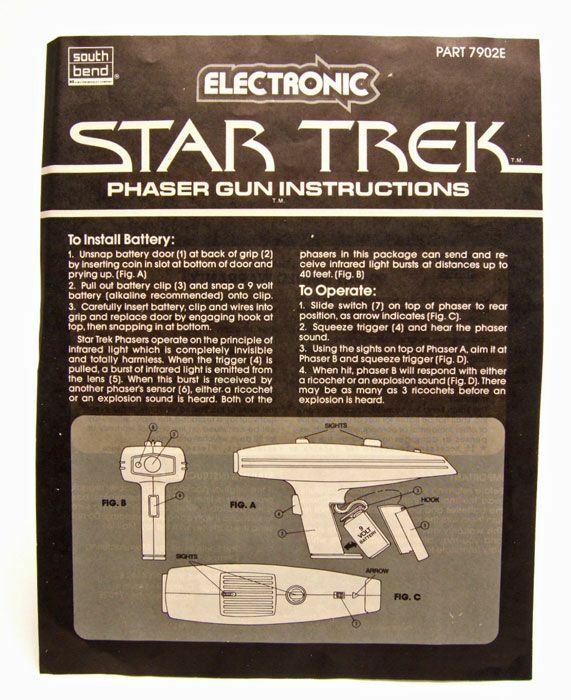 The South Bend Star Trek Electronic Phaser Gun Set! It's a prop replica! It's a game! No, it's BOTH! 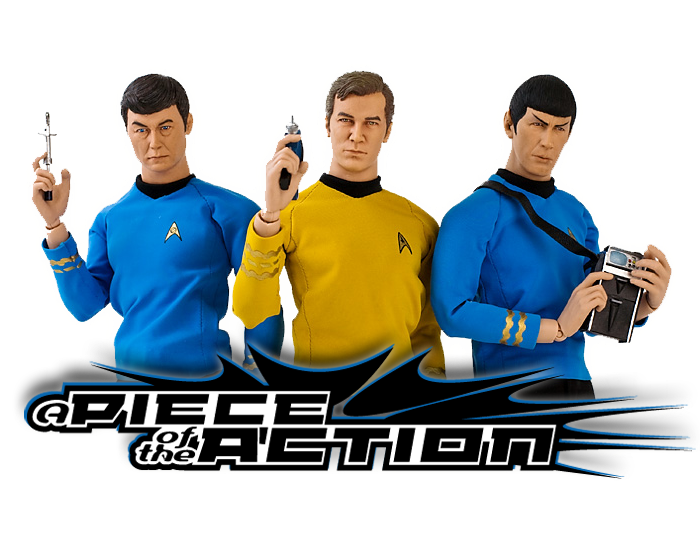 South Bend was one of those "blink-and-you'll-miss-it" companies that snagged a piece of the Star Trek action (hee...piece of the action) when the first motion picture came out. The South Bend company was a sub-division of Milton Bradley and was usually used as the brand name for their electronic toys. 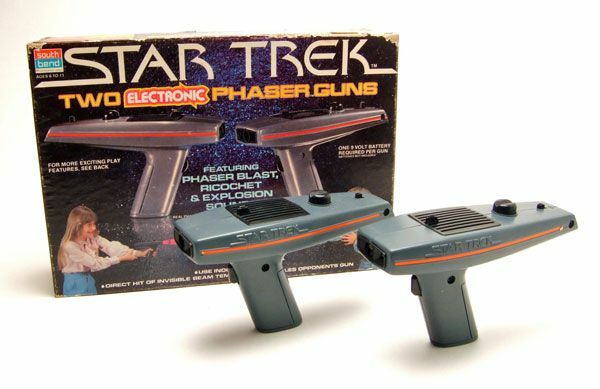 The brand name was used on these phaser guns, a really neat version of the Enterprise, and a sweet belt buckle/ insignia combo. The back of the box pretty much explains the deal here. 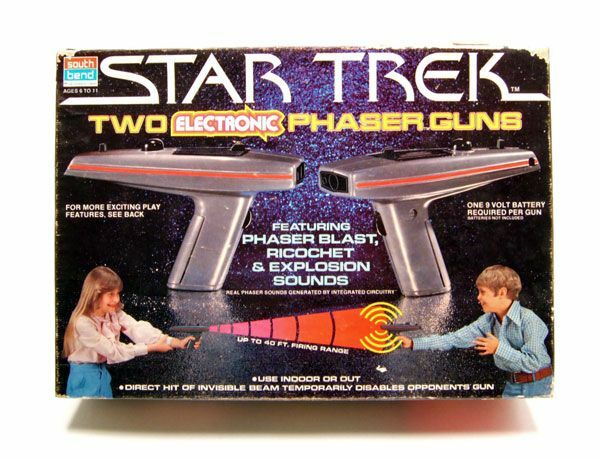 You get 2 phaser guns for you and your friend to reenact your favorite phaser battles from Star Trek The Motion Picture (oh wait...there weren't any). The box lists these as being for ages 6 to 11, so you only had a 5 year period where you could play with these apparently. How do they work? Glad you asked! As far as accuracy goes, we have to remember that these are toys. The shape is right though, and it's a passable job for something designed as a game and not a 1:1 replica. 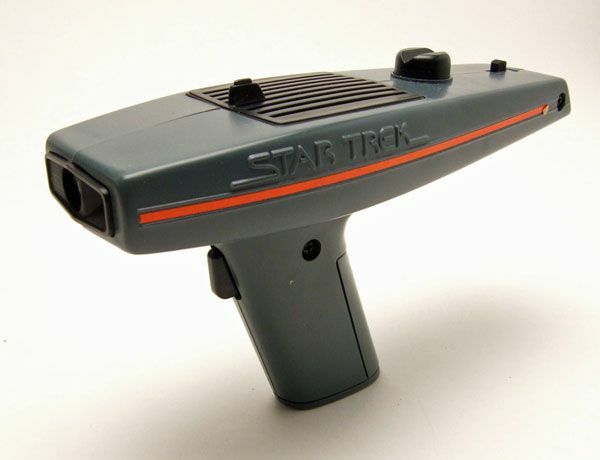 Funny thing is that you never really see the phasers in TMP, so when these were actually on shelves most folks had no idea what they were based on. Just like their Enterprise, the South Bend Phasers aren't that common, so if you're looking at picking up a working set in good shape, be prepared to shell out a little cash. They are a cool oddity though, and are actually pretty fun to play with. Take that V'Ger! 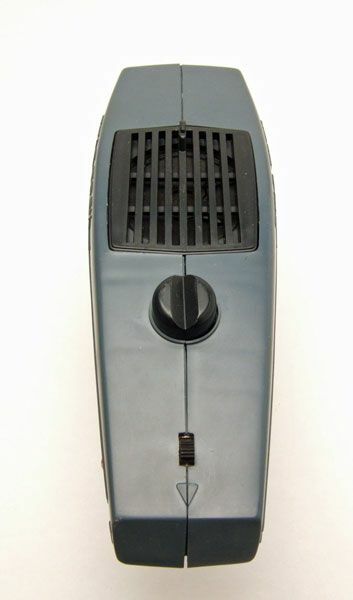 I remember a buddy of mine had a set of these in the mid 80's. 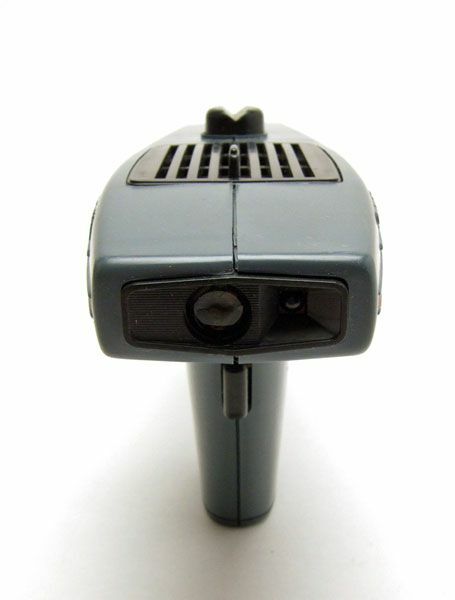 Thought they were one of coolest toys at the time. I actually forgot about playing with them unil I read this. Great piece and thank you for reminding me of my childhood. 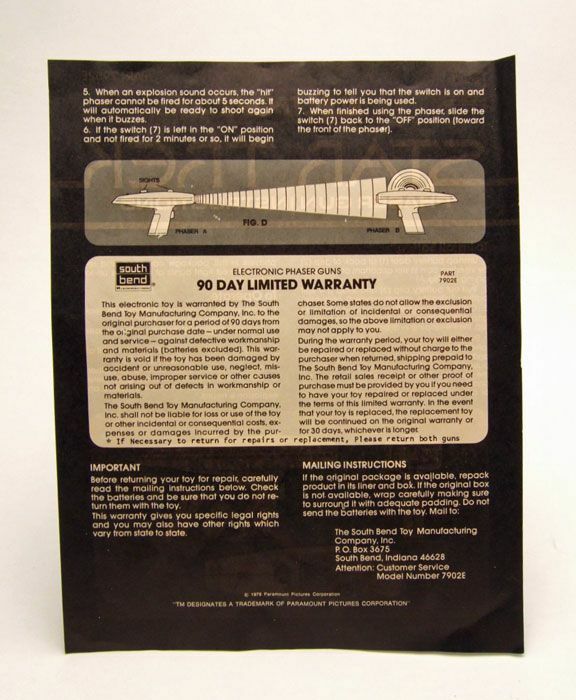 How much are these guns with the original box worth today.